When a wily wizard is on the loose, how far would you go to stop him? Good hearted Alex and her friend adventure-loving Steve are at it again, embarking on new and exciting exploits. The adventure begins when Steve asks Alex to check out his new, exciting railway that, once finished, will take you anywhere you could want to go. The railway is fun...until they wound up in the dessert getting chased by spiders and pricked by cacti! They also happen upon an old temple, with a sign, warning intruders to stay out.After deciding the sign must be ancient, the duo hops down into the tower to explore various treasure traps that are down there. Suddenly '" BOOM '" a TNT trap has been set, leaving Alex and Steve running for their lives.To Alex's dismay, Steve has been off in the dessert again, scoping out the old temple. He sees a mysterious stranger in a robe leave the temple, making sure that nobody could see him in his travels. Well Steve saw him, and has a bone to pick with him if he were the one who set the trap.The only problem is, Steve found potion bottles in the temple after the stranger left, confirming he is a wizard. And wizards can be dangerous. 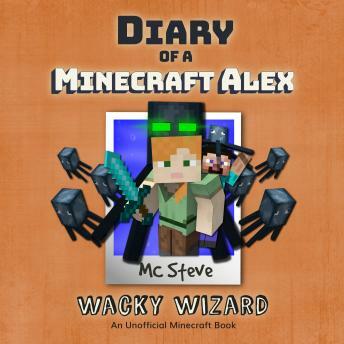 Will Steve convince Alex to take one last trip to the dessert to confront this Wizard? Will they stay safe? Time will tell when you listen to 'Wacky Wizard' A tale with too many twists and turns to count, 'Wacky Wizard' will have any young reader captivated '" even the ones that don't like to read.